The source code for the tools is held at GitHub! If you want to collaborate on this project, get in touch with us at isatools@googlegroups.com. We’ll be adding more templates shortly in the ISA format, making it even easier for you to use OntoMaton within Google docs. 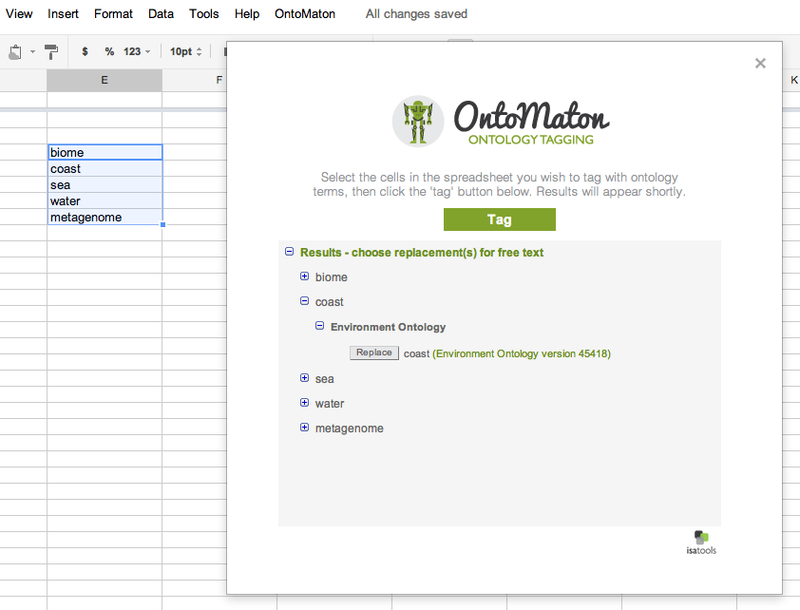 We are happy to announce the release of OntoMaton, a tool which allows users to search for ontology terms and tag free text right in Google Spreadsheets. This post will serve to introduce you to the tool, how it works and how it can make it easier for users to use ontologies in a pervasive, powerful and collaborative environment, complementing existing work from our team in the creation of ISAcreator. 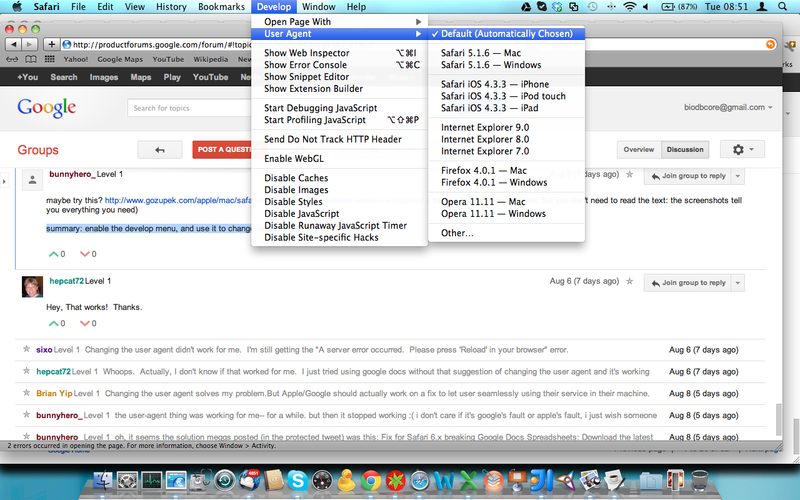 OntoMaton is available from the Google Script Gallery and when installed provides a menu as shown below. 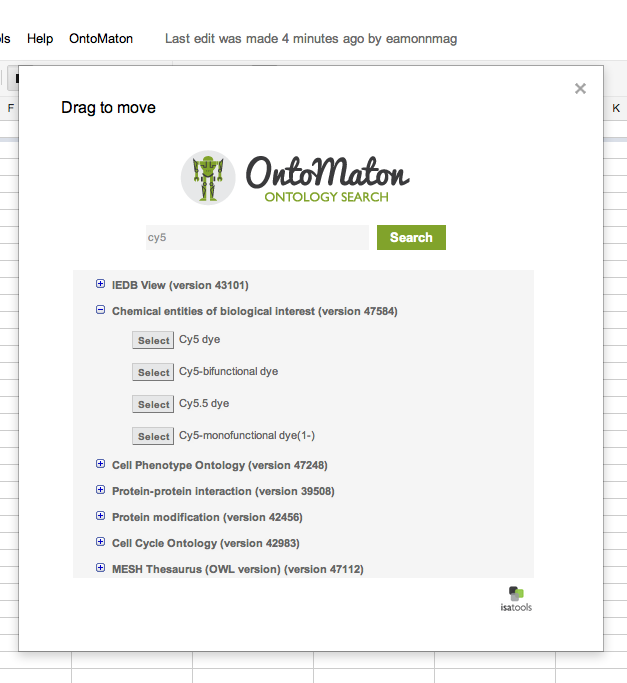 From the menu you may access two resources part of OntoMaton: ontology search and ontology tagging. There is also an ‘about’ option. If a sheet named “restrictions” is in your spreadsheet, OntoMaton will consult it to determine if the currently selected column/row name has a narrowed ontology search space. This makes it quicker to search BioPortal, allows for restriction of the user’s result space to make easier the process of selecting a term. For every term you select, it’s full details are recorded in a “terms” sheet. This makes it possible to use OntoMaton in any spreadsheet and all provenance information (including URIs, ontology source and version) for selected ontology terms will be immediately available for use when exposing your records to the linked data world! 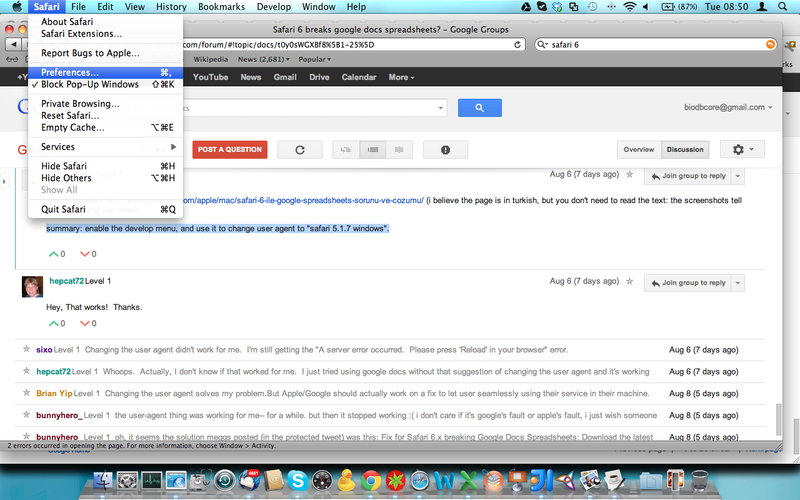 To install, create a new google spreadsheet, then go to the menu tools > script gallery. 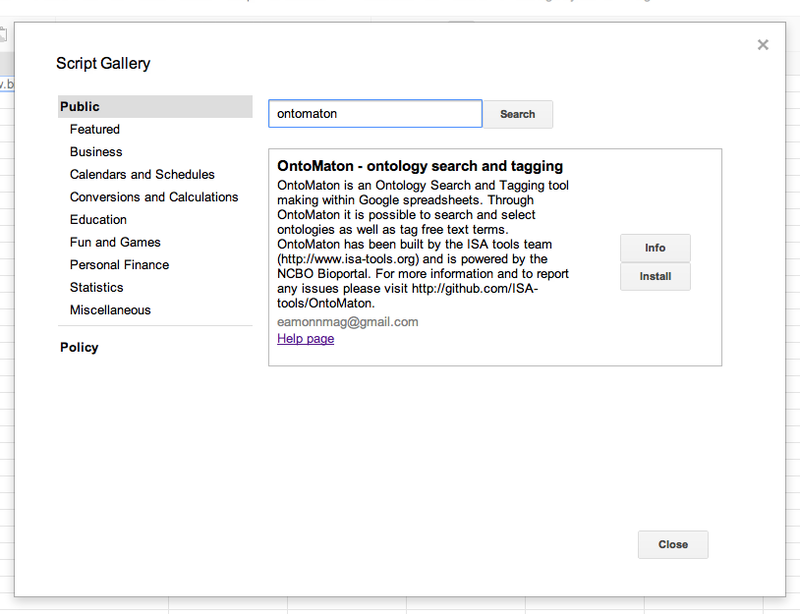 In the script gallery, search for ontology or ontomaton and you’ll get the following result pane. Click on ‘install’ and this will install the scripts inside your spreadsheet. Then there is one more and final step to follow for installation. You have to click again on tools > script manager and you’ll be presented with something like that shown in the image below. OntoMaton contains lots of functions, but the only one you need to worry about in order to run the program is the onOpen function. 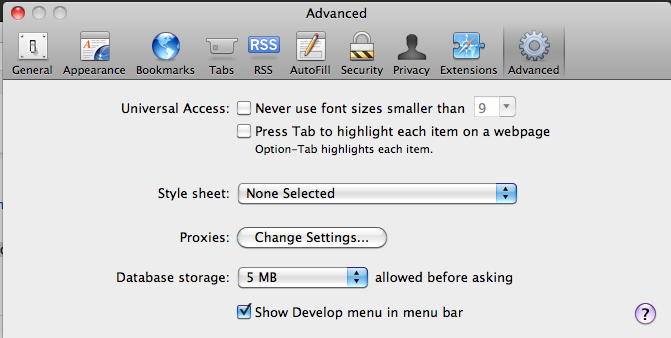 Click this then click on run and the OntoMaton menu will be installed in your menu bar. 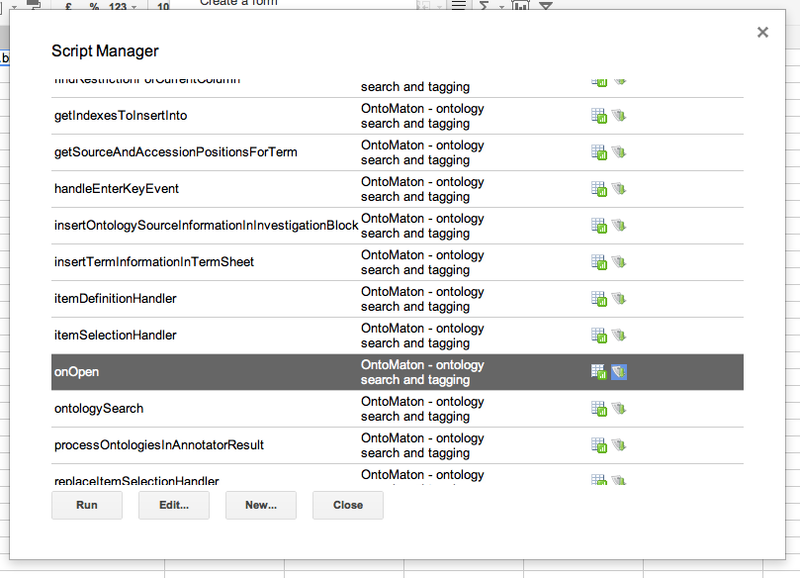 From here you’ll be able to access the ontology search and ontology tagging functions. OntoMaton inherently supports ISA-Tab files too. So if you have an investigation file it will automatically add ontology sources to the ONTOLOGY SOURCE REFERENCE block. Also, if you have Term Source Ref and Term Source Accession after a column, OntoMaton will automatically populate these columns for you. by versioning we refer to managing of user edits throughout the annotation process. Can you provide more details setting the list of allowed ontologies for the “restrictions” tab? Sure. You need a sheet named “Restrictions”. It should have the format as shown in this sample document. If you check out https://docs.google.com/spreadsheet/ccc?key=0Al5WvYyk0zzmdDNLeEcxWHZJX042dS0taXJPNXpJMHc&pli=1#gid=2 you’ll find the restrictions sheet. We can for those terms that have a definition however it slows up the query time significantly. We’ll have to work a bit with bioportal to improve this. Superschlagen! Looks canny lad, gut! Michel had a similar comment. We want to have the definition, however the query time on bioportal increases a lot. We will speak with the bioportal tea and see if this can be solved. If so, having definitions will be no problem. A slow tool that lets you pick the right ontology tool is better than a fast tool that helps you make mistakes.